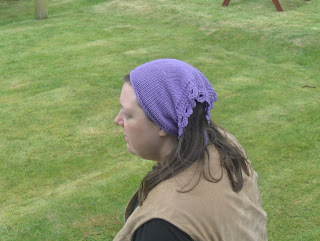 Here's a headscarf I've made from King Cole Bamboo Cotton blend DK. 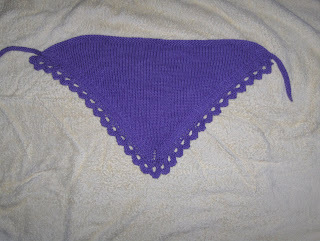 The main part is knitted in stocking stitch from the wide end down, the five last stitches being left live. Then the edging was added afterwards to the diagonal sides. 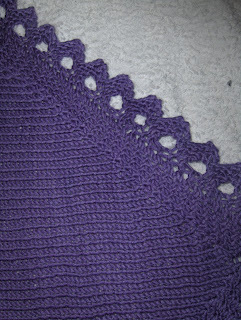 It is the lovely edging from Brooklyn Tweed's Girasole. Thank-you Jared Flood. I only have one ball of this yarn, bought from Drop in for a Yarn in Dumfries just to play with. I would very happily use this yarn again. Considering it is made up of a dozen thin strands of the bamboo and cotton mix I didn't find it splitty, but I would say that it shows up inconsistencies in tension. If I was making a garment out of this I would also watch out for creasing- it basically stays the way you put it so if you lay it away nicely it comes out pristine and if you stuff it in a bag it comes out crumpled. Give it few pats and it starts to smooth out for you. Three steps forward, two steps back.